Every runner is different, but the marathon presents a significant challenge of endurance to each runner who toes the start line. While training, fueling, hydration, and weather all play a factor in how you do on race day, the common downfall of most marathoners is pacing. Starting out too fast, hitting the wall, and slowing down over the second half derail the goals of many marathoners. In this post, I want to share with you some tips on how to pace your fastest marathon. 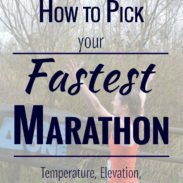 The best marathon pacing advice I have ever read – which helped me run my Boston Qualifying marathon time – is shockingly simple. Divide the marathon into two segments and treat it as a 20 mile long run followed by a hard 10K run. The first time (and several times again) I read this advice, I shook my head at it. Does that really work when you are chasing down a marathon time goal? Does this strategy only apply to elite runners who can whip out 20 miles in just over 2 hours? 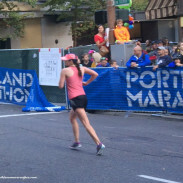 Then, after reading a blog post on Run Far Girl about pacing the half marathon and applying the strategy of starting slow and finishing strong, I took almost 5 minutes off my half marathon time. I began to wonder: if it worked so well in the half marathon, how would it work in the marathon? If you are doubting this as well, trust me: this strategy works. Treating the long run as a steady 20 mile run followed by a hard 10K is one of the most reliable methods for how to pace your fastest marathon. If you are worried about running too slow while maintaining a steady and comfortable effort in the first 16-20 miles, remember that goal pace will feel much easier on race day than in training. Usually, in training, your easy run pace will be 50 seconds or more slower than your goal race time. However, due to the taper and carb-loading, your goal marathon pace should feel just as comfortable as your normal easy pace on race day. Depending on the course, your training, and the day, you may run equal splits or you may run slightly negative splits. The goal here is simply to avoid running the second half of the race slower than the first by conserving energy at the start and pushing your hardest after the 20 mile mark. One of the biggest mistakes made in marathon pacing is starting out too fast. It’s a simple error to make: you are tapered, rested, carb-loaded, and excited. However, starting out too fast in the marathon can set you up for hitting the wall and struggling over the final 10K (or longer). When you begin a long run, you ease into the run. You don’t (or should not, if you are), begin right away at a steady pace or a faster pace than you intend to hold for the run. You start easy, warm up in those first few miles. That’s exactly how you want to start your marathon: treat the first few miles as as warm up and run them about 10-30 seconds per mile slower than goal pace. The marathon is a long race – you will have plenty of time to get on pace. In the scheme of 26.2 miles, a 10-30 extra seconds on a couple miles at the start will not cost you your goal time – but starting out at a 7:30 when you are trained to run an 8:30 could. By starting out slightly slower than goal pace, you conserve precious energy and save your legs for what’s to come. In his master’s thesis on a statistical analysis of the pacing of marathoners at the St. George Marathon, Jared Ward (yes, the same Ward who placed sixth in the 2016 Olympic Marathon) determined that a conservative start is the marker of a successful marathon. Ward found that marathoners who started out at a conservative effort slowed down the least during the second half and finished with faster times. Ward concluded, “marathoners seeking to improve performance would be to pattern pacing after what the elite and experienced runners are doing–start the race more conservative.” If it works for an Olympian and statistics professor, starting out conservatively is certainly a strategy worth considering. If your race begins on a downhill, such as Boston or California International, be careful to control your pace over the first few miles. 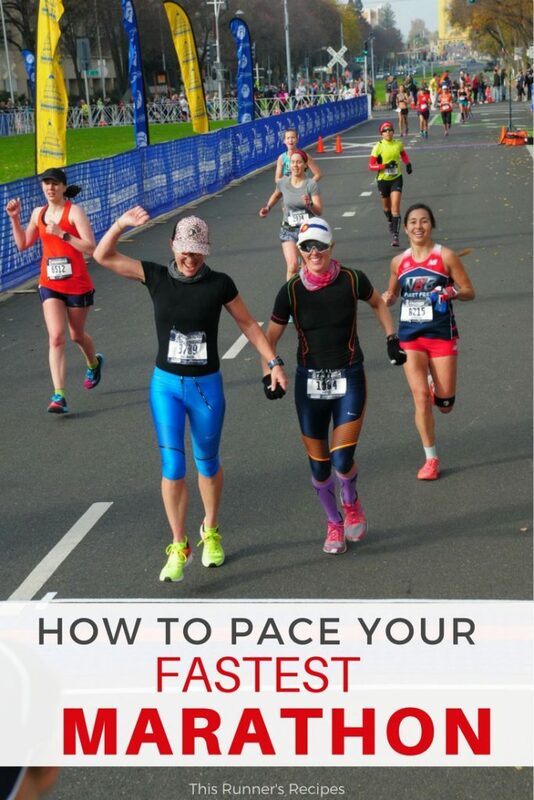 By controlling your pace and still starting out slightly slower than goal pace, you will conserve energy and avoid trashing out your quads early in the race. Even if you treat the first few miles as a warm up, the middle miles tempt many runners into getting greedy about their pace. At mile 6, 9, even 12, you likely feel good and are eager to pick up the pace a bit – but running faster than goal race in the middle miles will only haunt you later. Treating the race as a 20 mile long run with a hard 10K reduces the temptation to speed up in the middle. When you run a 20 mile long run, you keep the pace comfortable throughout the middle miles. Do the same on race day: keep your effort comfortable and your paces right on goal pace – resist the urge to speed up a bit once you are warmed up. How to pace your fastest marathon involves staying at a comfortable effort for as long as possible in the first 20 miles. Your marathon pace will likely feel comfortable through mile 16-18. You will have plenty of opportunities to run hard in the final 10K; focus on maintaining a steady pace and enjoy the race at this point. This, of course, hinges on whether or not you chose an appropriate goal pace. Your goal marathon pace should feel relatively comfortable by the end of training. If you are huffing and puffing hard to maintain that pace on those final goal pace workouts, you may want to adjust your goals. I like to think of the final 10K as not just a hard run, but as a hard progression run. Each mile becomes more and more difficult, so you need to increase your effort with each mile to stay on goal pace or run slightly faster. Not every mile will feel good, but the secret of how to pace your fastest marathon comes down to holding onto pace despite the discomfort and fatigue of these final miles. If you maintained a comfortable pace through the first 20 miles and are fueling and hydrating well, you shouldn’t hit the wall. The final 10K will not be comfortable no matter how well trained you were, but you can still finish strong despite this discomfort. Have some mental strategies to help you run through the aches and pains that settle into the body after running for 20 miles. When I coach first-time marathoners, the focus is on simply building up to the marathon distance – a huge challenge enough in itself. However, when runners come to me with a time goal in mind or the even more elusive goal of finishing the marathon strong, I prescribe a few key workouts for them. Since every training plan is developed solely for the individual, the mileage and frequency vary – these workouts are examples, not prescriptions. Please adjust all workouts for your current fitness and goals. 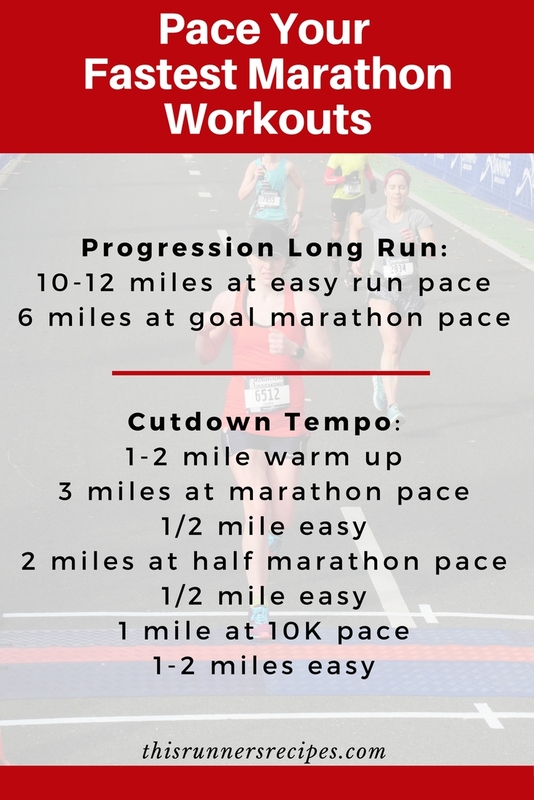 The progression long run is one of my favorite workouts for marathon training. This type of long run will train you to hold onto to your goal pace when your body and mind are tired – and therefore reveal to you if you have picked an appropriate race goal as well (although remember, bad workouts happen in training – so consider overall patterns in your training). The workout: On a 16-18 mile long run, run the first 10-12 miles at an easy pace, starting out slow and controlled for the first couple miles. Run the final 6 miles at your goal marathon pace. Choose terrain similar to that of your goal race. After the long run, tempo runs are the most important workout in marathon training. Both Brad Hudson and Jack Daniels combine marathon pace and threshold pace in workouts, which serve as the inspiration for this workout. The cutdown tempo run will train you to push harder after holding marathon pace for a while – just as you want to do in the final 10K on race day. The workout: Warm up for 1-2 miles. Run 3 miles at marathon pace, 2 miles at half marathon pace, and 1 mile at 10K pace, with a ½ mile easy jog between each. Cool down with 1-2 mile of easy running. Are you running your first marathon this fall or training for your fastest? Pre-register today for my fall 2017 virtual Marathon Training Group! If you prefer one-on-one coaching, you can learn more about my coaching services here. How did you pace your best marathon? Have you ever started out too fast in a race? I remember hearing that advice before I ran my first marathon. It helped me wrap my mind around running 26.2 miles when I had only run 20 miles as my longest run leading up to the race. I definitely agree that its better to start out conservatively! It does help in that aspect – in marathon training, 6.2 miles isn’t a long distance by any stretch! What fantastic advice! I will say that the idea of running 20 easy miles followed by progression 10k does sound scary but if I was in training right now it would seem more doable. Hopefully one day I’ll be able to put it into practice. Thank you! It does sound scary – but those training runs do help. I know one day you will be able to put it into practice now that you’ve figured out what was wrong! LOve this! 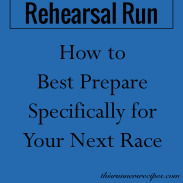 It is shockingly similar to how I pace my own races! I did get advice from some great runners! This is fantastic advice. 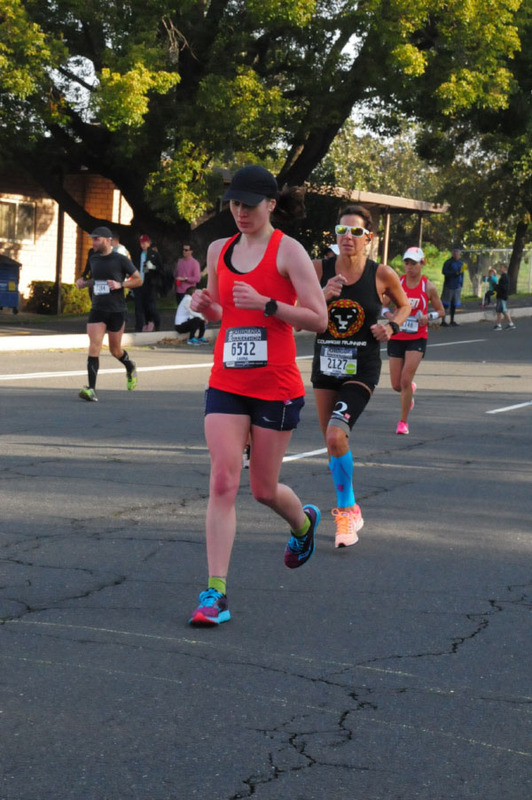 I went out too fast on my last marathon and completely fell apart at the end. But I do think it’s important to train for negative splits so thanks for ideas on how to do that. Thank you! It is hard to run a negative split without practicing it in long runs – train for every detail when leading up to racing! Yes!! Such a great post! The fastest marathons that I have run have been the ones where I followed this strategy and went for the negative splits at the end! I cannot wait to continue to follow your Boston Marathon journey! Thank you! I think the strong race you ran at Boston in that heat is certainly proof of how a strategy like this works! I like that strategy! During my last marathon, I kept trying to slow down in the beginning. It’s so hard to go slow with all the adrenaline, but that is something I need to work on so I don’t burn out later on. It’s so hard to start out slow with all the excitement on top of the taper! That’s when I learned that checking pace can help. Wow, this makes so much sense! I ran my first marathon last year and of course the main goal was to finish! If I ever do sign up for another, I’d definitely keep this in mind! Thank you! If you do sign up for another, we will definitely make sure you train to run this way! And the second one is always easier to pace – knowing you can finish one builds a lot of confidence! I thought the same thing, but it’s amazing how much of a difference it can make (combined with fueling lots). It’s not like there’s energy abounding, but it is easier to push on that final 10K! Ah. I’ve always wanted to try that approach, to start slow and finish strong, but so far I haven’t been able to rein it in; I get too worked up. I really should discipline my mind and emotions though! Because I KNOW I’d be more successful. I would not be surprised at all if you held it back at the start and then knocked that sub-3 out of the park. I love these tips, especially the part about the 10k being a progression run! It definitely feels harder with each mile, even if your pace is slowing down. I’ve made the go out too fast mistake a few times and try really hard now to start conservatively and negative split in pretty much every distance except the 5k! It’s a lesson learned over and over again, but it definitely works! I’m just hoping I don’t start out too fast in my 10K this weekend! Right on point! 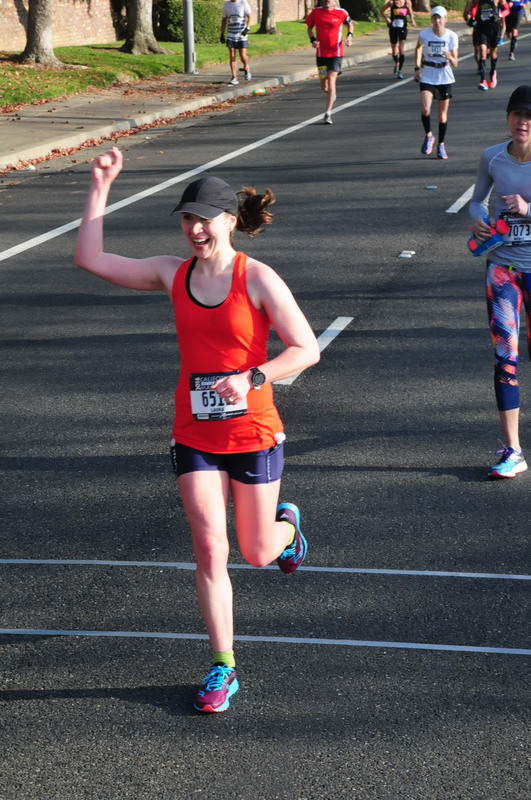 I ran my fastest half marathon by starting conservatively – and I really had to force myself to hold back. The final 5K of that race felt incredible and I finished strong. My fastest marathon time was back in 2008 where I actually qualified for Boston but I made the mistake of keeping up with the pacers (who started out too fast) and paid for it at the end and was fortunately to BQ. This will be the strategy I’ll use in racing Chicago this year and aiming for a strong finish! It’s amazing how well this method works for both the half and the marathon! Good luck on your training for Chicago!